WILLIAM A. NORTHCOTT, of Greenville, Ill., is the States Attorney of Bond County, and the senior member of the law firm of Northcott & Fritz. He was born January 28, 1854, in Murfreesboro, Tenn., and is the son of Gen. Robert S. and Mary C. (Cunningham) Northcott. The father and mother were both natives of Rutherford County, Tenn. The former received such limited education as could, at that early day, be obtained in the county schools. He was a man of great intellectual activity, well versed in all scientific and literary questions, and for many years prior to the outbreak of the Rebellion he was the editor of the Rutherford Telegraph, a newspaper of which he was the founder. He was a candidate on the Union ticket as a delegate to the State Convention which was to decide the question whether or not Tennessee should remain loyal to the Government. Before the assembling of this convention their work was anticipated by the Legislature of Tennessee, which was very strongly in favor of secession. This Legislature accordingly passed an ordinance by which Tennessee was placed on the Confederate side. Gen. Northcott's Union sentiments made it seem best that he should leave his native State, which he therefore did, going North to Vevay, Ind., at which point he had relatives. Soon after the train which was hearing him northward had left Nashville, the authorities of that city received a telegram from Jefferson Davis to arrest him, but, luckily for Gen. Northcott and his friends, the telegram came too late. After a few months' residence in Indiana, at the request of Senator Carlisle, of West Virginia, Gen. Northcott removed to Clarksburg, in that State, and there established a newspaper which he named the Clarksburg Telegraph, and which is still in existence. Gov. Pierpont, of West Virginia, gave Gen. Northcott a commission as Lieutenant-Colonel of the Twelfth West Virginia Regiment. He was taken a prisoner of war in the battle of Winchester, and was confined for nine months in Libby Prison. Since his release, he has written many articles describing his captivity. While he was there confined, Gen. Straight, of Indianapolis, and many others made their memorable escape from the prison by means of a tunnel. Gen. Northcott had assisted in planning and digging the tunnel, but at the time of the escape was unable to reap the fruit of his labor on account of being very ill and confined to his bed. He was afterward exchanged with other prisoners and was breveted Brigadier-General by the President, and at one time commanded a brigade in the same division with President Hayes. After the close of the war, Gen. Northcott took a prominent part in the politics of West Virginia and was elected a delegate to the National Republican Conventions of 1868 and 1872. For a period of ten years, extending from 1868 to 1878, he was Registrar in Bankruptcy for the District of West Virginia. He was an Aid-de-Camp on the staff of Gen. Fairchilds, Commander-in-Chief of the Grand Army of the Republic, and is at present a member of the National Executive Council of that organization. He still resides at Clarksburg, W. Va., at the advanced age of seventy-three years, and has retired from active business. The paternal grandfather of our subject was Hosea Northcott, who was born in Wilmington, N. C., and was a brother of Benjamin Northcott, a Methodist minister of note who lived in Kentucky. Hosea Northcott settled in Tennessee in an early day, and was present at the famous duel between President Jackson and Richardson, in which affair he always blamed the former very much for his action. He never voted for the Democratic party during his lifetime and his illustrious example has been followed by his son and grandson. Hosea Northcott was a nephew of James Northcott, of England, a somewhat celebrated writer of fables. His father, William Northcott, emigrated from England to North Carolina, and from him are descended the numerous families of that name now living in the United States. The mother of William A. Northcott, who bore the name of Mary Cunningham before her marriage, was of Scotch ancestry. Her father, Dr. Cunningham, died when she was quite young. She was next to the youngest in a large family. One of her older brothers was a soldier in the War of 1812 and fought with Jackson at New Orleans. Septimus, her youngest brother, was a soldier in the Mexican War and has never been heard from since that time. It has never been known whether he was killed in battle or taken prisoner. Her eldest brother, James, like her father, belonged to the medical profession, and died at Mount Vernon, Ill., at the age of seventy-six years, leaving several children who now reside in that State. Mrs. Northcott's mother was a cousin of Mrs. Gen. Logan, who also bore the name of Mary Cunningham before her marriage with the General. Mrs. Northcott was a woman of great energy and courage. While her husband was in the army and a prisoner, she took care of her little family and so carefully managed her finances as to accumulate enough money to purchase a home out of the salary which her husband sent to her. That homestead is still owned by the family. Her death occurred on the 5th of August, 1881, after an illness of several months. The subject of this sketch, William A. Northcott, is said to resemble his mother very much in physical appearance and is fortunate enough to possess in a great degree her energy and concentration of purpose. From his father he inherited a taste for literature, public speaking and writing. He attended school at the Northwestern Academy, in Clarksburg, W. Va., until thirteen years of age. He was then a page in the State Senate at Wheeling, W. Va., for two years, and there cultivated his taste for public speaking and his love of parliamentary debate. In September, 1869, he entered the United States Naval Academy, at Annapolis, Md., where he remained until June, 1873. During this time, he made several voyages on the Atlantic, visiting parts of Europe, the Madeira Islands, and also going to portions of British America. From 1873 to 1877, he taught school and studied law at Clarksburg, W. Va. In July, 1877, he was admitted to the Bar and after practicing law with considerable success in that State, he removed in June, 1879, to Greenville, Ill., where he has engaged in the practice of law up to the present time. In 1888, the President appointed him as Supervisor of the Census for the Seventh District of Illinois, which position he filled to the great satisfaction of the department, and for his services received a very complimentary letter from Supt. Walker. In April, 1882, our subject was elected States Attorney of Bond County, which position he still holds. In June, 1890, the President selected him to serve as a member of the Board of Visitors of the United States Naval Academy. On this commission were such distinguished men as Admiral Kimberly, Senators Hale and Blackburn, Congressmen Boutelle, Wallace, Rush and others. At the same time the newly-elected Senator of New Hampshire, Mr. Gallinger, also served on this board. Mr. Northcott was selected as the orator to deliver the address to the graduating class by the vote of this board. This was a high honor to be thus selected from such distinguished men. So well did Mr. Northcott fulfill the task assigned him that his address was generally considered to be one of the finest ever delivered on such an occasion. It was published and favorably commented upon in most of the leading papers of the country. He is an orator of considerable note and is always active on the stump in every campaign in behalf of the Republican party. In 1884, he spoke at Centralia and Belleville with Gen. Logan and was continuously in the campaign of that year and also in that of 1888. He believes strongly in the protective tariff and in the principle that the right of the Federation is superior to the right of the State. While he is earnestly devoted to the Republican party, he is not a radical partisan and is so fair in his relations to his Democratic acquaintances that he has always polled a large Democratic vote in his political contests. As a lawyer, Mr. Northcott is very successful, being earnest and indefatigable in his labors for his clients, and by this means he is enabled to win in a large majority of cases, and is engaged on one side or the other of nearly every case on the docket of courts in this county. He also takes an active part in the real-estate business and is one of the hardest workers in Greenville, but he has his various business interests so systematized that they are all conducted in a proper manner. In March, 1880, Mr. Northcott married Julia A. Dressor, the daughter of Nathaniel Dressor, the largest land-owner of Bond County and President of the First National Bank of Greenville. Mrs. Northcott departed this life on the 15th of March, 1881, leaving an infant son who is still living. In September, 1882, our subject married his present wife, whose maiden name was Ada Stoutzenburg, of Marine, Ill., and by this union has been born one child, Amy Allen, now five years old. The child of the former marriage is Nathaniel Dressor Northcott. Our subject and his worthy lady have a very pleasant home and they delight to entertain their many friends and visitors. Mrs. Northcott is a musician of considerable reputation and comes from a family noted for their musical abilities. The families of both our subject and his wife are members of the Episcopal Church. Mr. Northcott had three brothers and two sisters, of whom all survive with the exception of one sister. Mrs. Naomi Everett is the Principal of the High School at Huntington, W. Va. In the summer of 1890, the readers of the Cincinnati Post voted for the most popular lady teacher in the States of Ohio, Indiana, West Virginia and Kentucky. The Post promised to give a free trip to Europe to the one receiving the highest number of votes. Mrs. Everett was the proud recipient of one hundred and seventy-five thousand votes and was therefore awarded the prize. G. A. Northcott, although only a young man, is at the head of a large clothing establishment in Huntington, W. Va. Another brother, Robert H., is Cashier of a bank at Akron, Colo. The youngest brother, Elliott, is studying law in the University of Michigan, at Ann Arbor. On the 13th of November, 1890, Mr. Northcott was elected Head Consul of the Modern Woodmen of America. 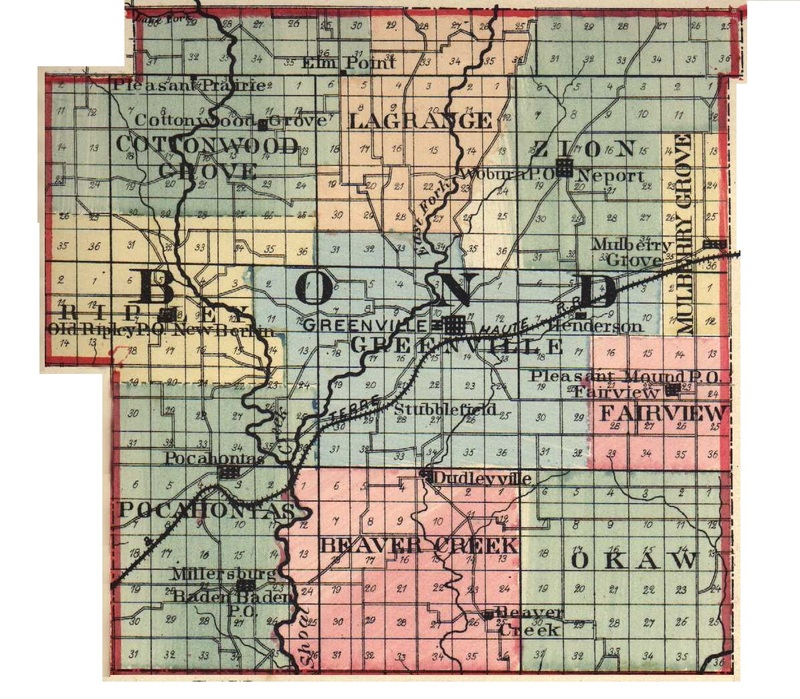 This places him at the head of the largest fraternal insurance society in the Northwest, comprising in its membership fifty thousand of the best citizens of the States of Illinois, Michigan, Wisconsin, Minnesota, North and South Dakota, Iowa, Nebraska and Kansas. Until the summer of 1888, Mr. Northcott had never been a member of secret societies, but since that time has united with the Modern Woodmen of America; the Odd Fellows; the Masons; Knights of Pythias and Sons of Veterans. Extracted 29 Nov 2016 by Norma Hass from 1892 Portrait and Biographical Record of Montgomery and Bond Counties, Illinois, pages 146-149.